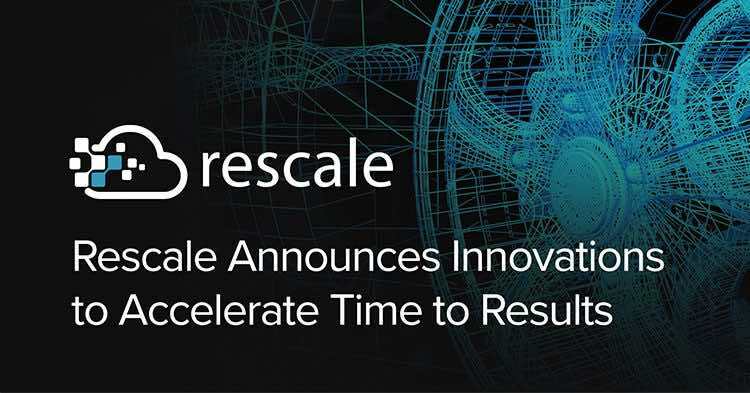 SAN FRANCISCO, Nov. 14, 2018 — Rescale, the leader in enterprise big compute in the cloud, today at Supercomputing 2018 announced the release of new high-performance computing (HPC) workflow capabilities: high-performance storage (HPS) and End-to-End desktops. With these tools, enterprises can now boost efficiency and enhance team collaboration. Rescale High Performance Storage (HPS) greatly improves simulation workflow efficiency and speed by providing fast access to recurring shared data (such as geometry, meshing and load scenario data, etc.). Furthermore, this high-speed persistent filestore can be shared across multiple concurrent users, clusters, or desktops. End-to-End desktop workflows allow users to launch multi-node, high-core count jobs directly from the application software user interface (UI). This provides direct interactivity with the job, allowing pausing, modifying the mesh(es), and resuming, all directly from the application UI. The advanced abilities of Rescale HPS and End-to-End desktop workflows give users a simpler transition to hybrid and cloud. Shared high performance storage is common on-premise and Rescale brings this capability to cloud workflows. For users who today run jobs in a workstation, End-to-End desktops enable them to continue a traditional workstation experience, while transparently leveraging hundreds of cores across powerful large clusters in the cloud. For more information on storage and virtual desktops, visit www.rescale.com. Rescale is the leader in enterprise big compute in the cloud. Rescale empowers the world’s transformative executives, IT leaders, engineers, and scientists to securely manage product innovation to be first to market. Rescale’s ScaleX® multi-cloud platform, built on the most powerful high-performance computing infrastructure available, seamlessly matches software applications with the best architecture in the cloud or on-premise to run complex data processing and simulations. Rescale partners with the four largest cloud service providers, and enables over 125 Global 2000 enterprise customers including four of the top five largest global automotive manufacturers and two of the top three largest global aerospace and defense companies. For more information on Rescale, visit www.rescale.com.